This large Apache tear, still in its perlite matrix, shows a pronounced conchoidal fracture pattern. When the Spanish conquistador Hernán Cortéz confronted the Aztecs in 1519 in what is now Mexico, horses, steel swords, and firearms gave his soldiers a decided military advantage. But there was one Aztec weapon that the Spaniards dreaded—the macuahuitl. This 4- to 5-foot-long piece of wood, similar in shape to a large broadsword, had a two-handed grip and grooved edges set with pieces of flaked stone. In the words of Bernal Diaz del Castillo, one of Cortez’ soldiers, a macuahuitl in the hands of skilled Aztec warriors could—and occasionally did—completely sever the heads and legs of the Spaniards’ horses. The flaked stones in the macuahuitl, which the Spaniards described as “sharper than a blade of Toledo steel”, were made of obsidian. Flaked obsidian has by far the sharpest edge of any natural material. Because of this razor-sharpness, along with its abundance and workability, it was a vital material in many Stone Age cultures. The sharpness of an expertly flaked obsidian edge cannot be overestimated. Eye surgeons and neurosurgeons today use obsidian “microblades” that are sharper even than the finest surgical-steel scalpels. Obsidian’s ability to take an edge is only one aspect of this remarkable material. Obsidian is also a gemstone and an ornamental stone, and it has a rich history and lore—quite a resumé for a material that does not even qualify as a mineral. These 1-inch Apache tears are surrounded by a mass of gray perlite. Minerals are naturally occurring, homogenous, solid materials of inorganic origin with definite chemical compositions (within limits) and ordered crystalline structures. But because obsidian is amorphous and has an indefinite composition, it is correctly classified as a mineraloid—a minerallike material that does not satisfy the definition of a mineral. Obsidian is an extrusive igneous rock that formed from the solidification of rhyolitic (silica-rich) lava. It consists primarily of silica, with smaller amounts of feldspar, ferromagnesian, alkali, and alkaline-earth minerals. Its average composition, expressed in oxide content, is 75% silicon dioxide (silica); 14% aluminum oxide (alumina); and about 2.5% each of calcium oxide, sodium oxide, iron oxide, and magnesium oxide. Also present are varying small amounts of water, as both attached water molecules and vapor, trapped within tiny cavities. Depending upon how quickly it cools and solidifies, rhyolitic lava can form four types of rock, all with identical chemistries, but differing radically in appearance and physical properties. When intruded into existing rock formations where it cools slowly, rhyolitic magma crystallizes on a mineral-by-mineral basis to form coarse-grained, crystalline granite. Rhyolitic lava that is extruded onto the surface, where rapid cooling restricts crystal development, solidifies into rhyolite, a fine-grained, crystalline, extrusive rock. 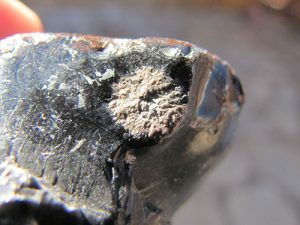 When saturated with gas bubbles and almost foamy in consistency, extruded rhyolitic lava solidifies into pumice, a very porous rock that is sometimes light enough to float on water. Finally, when rhyolitic magma is extruded in conditions that result in extremely rapid solidification with no time at all for crystal development, the product is obsidian, or volcanic glass. Obsidian forms only in conditions that permit immediate cooling, such as at the edges of lava flows or where lava has extruded directly into lacustrine or marine water environments. 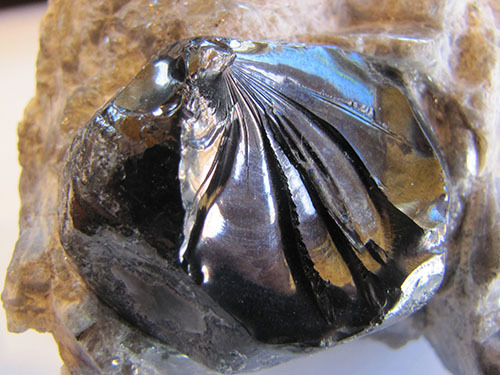 Obsidian was initially thought to be a form of quartz. However, quartz consists entirely of silica, while obsidian consists primarily of silica. Despite somewhat similar compositions, obsidian is about 10% less dense than quartz. In quartz’s orderly crystalline structure, close atomic packing maximizes density. But the looser atomic packing and random molecular arrangement in obsidian’s amorphous structure make it less dense. The specific gravity of quartz is 2.65; that of obsidian ranges only between 2.4 and 2.5. With its rigid, crystalline structure and strong, covalent bonding, quartz (Mohs 7.0) is considerably harder than obsidian (Mohs 5.0-6.0). Without cleavage planes, both quartz and obsidian exhibit a pronounced conchoidal fracture. Conchoidal fractures appear as smoothly curving, concave breaks similar in shape to the inner surfaces of bivalve mollusk shells. The word “conchoidal” stems from the Greek konchoeid's, meaning “like a mussel”. When quartz or obsidian is struck by an edged or pointed object, fracturing and an accompanying shock wave of mechanical energy progress almost instantaneously from the point of impact at an angle slightly declined from the surface. Fracturing absorbs part of the shock wave energy which, as it decreases, exerts its greatest pressure in the direction of least resistance. This “steers” the developing fracture back toward the surface, displacing a thin flake of quartz or obsidian and leaving behind a conchoidal depression. Obsidian’s most common colors—black, greenish-black, and smoky—are due to its essential components, iron and magnesium. An excess of iron produces reddish-brown to mahogany colors. With unusually low amounts of iron and magnesium, obsidian is nearly colorless. Obsidian is often included with spherulites, which are spherical, crystalline bodies of radiating crystal fibers, and lithophysae, which are mineral-filled cavities. Both spherulites and lithophysae sometimes reflect light to produce yellow or golden colors, and occasional iridescence. Spherulites consist of feldspar-group minerals, quartz, and cristabolite (a tetragonal polymorph of quartz), which crystallized immediately prior to, or during, the rapid solidification of the obsidian. Closely spaced spherulites appear as streaks or layers of color, and reflect light to produce the distinctive sheen in “rainbow” obsidian. Lithophysae are filled with concentric structures of quartz, topaz, and certain feldspar and tourmaline-group minerals. These cavities form from gases in the original lava, and gases are the source of the minerals that fill them. Groups of lithophysae create the distinctive “blotch” pattern of “snowflake” obsidian. Iridescent “fire” obsidian contains particulate magnetite in multiple layers that are roughly as thick as the wavelengths of visible light. When at or near the surface of the obsidian, reinforced reflection of white light from adjacent layers produces attractive, iridescent colors. Newly solidified obsidian contains only about 0.2% water. But after solidification, atmospheric water begins to slowly diffuse into the obsidian through microscopic cracks created by its rapid cooling. Over time, this hydration process alters obsidian into perlite, which has a substantially higher water content of about 3.5% and a very different appearance. Perlite forms gray, glassy masses of shell-like, concentric flakes that eventually weather into its small, namesake, pearllike spheres. Because obsidian alters into perlite in under 20 million years, all existing obsidian has formed from lava flows that, geologically speaking, are relatively recent. Perlite is an industrial commodity. When heated to 1,600° F, its contained water changes to steam that expands each tiny “pearl” structure into a bubble 20 times its original volume. “Expanded” perlite, which is air-filled and very light, has uses in insulation, roofing tiles, soil additives, and lightweight concrete. Obsidian nodules known as “Apache tears” are remnants of the hydration process that alters obsidian into perlite. This process progresses slowly into the interior of the obsidian until all that remains are small, rounded obsidian cores—Apache tears—embedded within a surrounding mass of perlite. Eventually, Apache tears will alter into perlite. Archaeologists have recovered tools and weapons of flaked obsidian from African cultural sites over 100,000 years old. An interesting Neolithic use of flaked obsidian was as scalpels for trephination, the surgical removal of pieces of the human skull to relieve brain pressure or, from a shamanistic perspective, to permit the escape or entrance of spirits. Only obsidian blades were sharp enough to cut bone so precisely that skull sections could be replaced and later heal. The Aztecs knew obsidian as teoteti (“divine stone”) and considered it sacred, using it for tools, weapons, mosaic inlays, ceremonial blades for human sacrifice, and mirrors. The Aztec god of sorcery and divination, Tezcatlipoca, was thought to live within obsidian and revealed his image in reflections from its glassy, mirrorlike surface. In Aztec legend, Itzcoliuhqui, the god of the curved obsidian blade, after being blinded and cast down from the heavens, sought revenge by slashing random victims with obsidian blades. Aztecs used obsidian knives in human sacrifices intended to give the sun the strength to replace the night. Only obsidian blades could remove hearts quickly enough to be lifted to the sun while still pulsating. The Aztecs also practiced self-mutilation, ritualistically cutting their tongues and ears, then flinging the blood high in offerings to the sun. 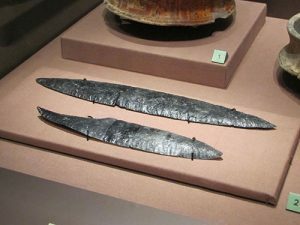 Anthropologists believe that obsidian blades explain the Aztec’s ready acceptance of self-mutilation: The blades were so sharp that the incisions were hardly felt. Obsidian is named for Obsius, a Roman legionnaire who discovered an obsidian deposit in Ethiopia. 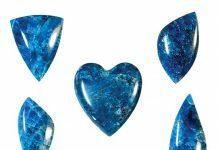 In documenting Obsius’ discovery, the Roman scholar Pliny the Elder referred to the stone as obsianus lapis, literally “stone of Obsius”. Over the centuries, this phrase morphed into obsidianus lapis—the basis of the modern word “obsidian”. Europeans were intrigued by the spiritual aspects of the Aztecs’ obsidian mirrors. Dr. John Dee, an English occultist and consultant to Queen Elizabeth I, used an Aztec mirror to divine the queen’s future. Among the most celebrated of all Elizabethan artifacts, Dee’s obsidian mirror is displayed at the British Museum in London. Thin, conchoidal flakes of obsidian have the sharpest edges of any natural material. still confused with quartz. This confusion remained for another 130 years, until X-ray diffraction analysis finally proved that obsidian lacked a crystalline structure and was therefore neither quartz nor a mineral. In the American West, the four sacred “stones” of the Navajo are obsidian, turquoise, abalone shell, and white shell. In Navajo creation stories, First Man has feet of earth, legs of lightning, and a heart of obsidian. A more recent Southwestern legend focuses on the origin of Apache tears in the ridges near Superior, Arizona, which are part of the 18 million-year-old Superior Volcanic Field. One particular eruption extruded viscous, silica-rich lava that solidified into obsidian, most of which has now altered into perlite, with remnant nodules of obsidian. The term “Apache tears” originated after 1870, when the United States Army was suppressing the Apaches in Arizona Territory. That year, the army trapped a band of Apaches atop a steep volcanic ridge called Big Picacho. Some 75 Apaches lost their lives, many by riding their horses over cliffs rather than dying at the hands of the soldiers. This factual battle fostered a legend that tells how families of the deceased warriors, upon hearing of the tragedy, shed tears that fell to the ground and turned to stone—the local obsidian nodules. Big Picacho was later renamed “Apache Leap”. Apache tears are considered good-luck charms; those who carry them supposedly will never cry, because Apache families have already shed their tears for them. Apache tears gained popularity among collectors only after perlite mining began at Superior in 1946. The obsidian nodules, a commercially undesirable component of the perlite, were removed during milling and discarded on the mine dumps. In the 1950s, commercial collectors began gathering the Apache tears by the sack full and selling them rock shops across the country. Although Superior’s perlite mines are now closed, Apache tears remain a popular collectible. Obsidian is a preferred material among flintknappers. Flint knapping is the art of fashioning stone materials into utilitarian and decorative objects by systematically breaking (knapping) conchoidal flakes off the main piece. In the early 20th century, two individuals dominated the art of flaking obsidian. One was Ishi, a California Yahi Indian, who flaked obsidian to survive; the other was Don Crabtree, a master flintknapper whose proficiency in flaking sharp obsidian edges would astound scientists. In 1911, Ishi, the last member of his vanished tribe, wandered the still-unsettled foothills north of the Sacramento Valley, surviving by hunting and gathering in true Stone Age fashion. 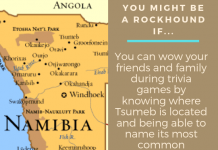 But when a power company surveyed a transmission-line route through the wilderness, he fled his cave, leaving the surveyors to collect his bows, arrows, and obsidian points and knives as “souvenirs”. Weeks later, Ishi, emaciated and starving, wandered into the town of Oroville. News of the “last wild Indian” drew the attention of anthropology professors at the University of California, Berkeley. They befriended Ishi and brought him to the university where, in just six months, 24,000 people came to see his demonstrations of flint knapping and fire making. 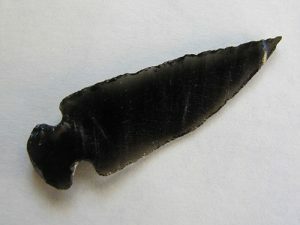 This obsidian point was flaked by a modern flint knapper. Intrigued by Ishi’s extraordinary skill in flaking obsidian, the professors recorded his knapping techniques in detail and built a collection of his notched, razor-sharp, obsidian hunting points. When Ishi died in 1916, his university friends placed one of his bows and pieces of his flaked obsidian in his coffin as a tribute. Ishi’s obsidian-flaking techniques were forgotten until Don Crabtree began work as a vertebrate-paleontology preparator at the university in the 1930s. A master flintknapper, Crabtree became intrigued with the detailed accounts of Ishi’s obsidian-flaking techniques and attempted to replicate them. He eventually received a National Science Foundation grant to further his lithic-technology studies. By 1970, Crabtree had succeeded in replicating Ishi’s obsidian-flaking techniques by preshaping cylindrical “cores”, then knapping them into inch-long “microblades”, each a single, extraordinarily sharp, conchoidal flake. In 1974, Crabtree showed his obsidian “microblades” to medical researchers, whose tests confirmed that they were much sharper than their stainless-steel surgical scalpels. Under the 10,000-power magnification of electron microscopes, the cutting edges of surgical scalpels—because of steel’s crystalline structure—retain a blocky shape that limits their degree of sharpness. But because obsidian lacks are therefore much sharper than those of surgical steel. Clinical tests showed that incisions made with obsidian produce less scar and granulation tissue, heal faster, and inflame fewer cells than do incisions made by stainless-steel scalpels. Obsidian scalpels are now used in specialized eye surgery and neurosurgery procedures. 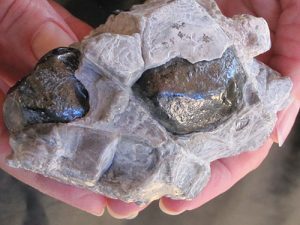 Obsidian’s unique weathering properties are helping to establish the age of obsidian artifacts. 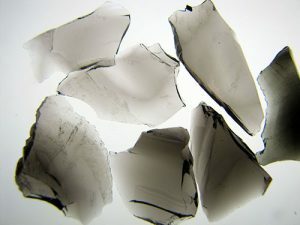 The technique of obsidian-hydration dating presupposes that a fresh surface is created when an obsidian tool is flaked. 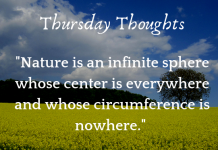 As these fresh surfaces slowly hydrate and alter into perlite, they form a thin, water-rich, hydration “rind”, the thickness of which can be accurately measured by optical methods. Being a function of time that is independent of climatological conditions, rind thickness therefore directly indicates the age of exposed obsidian surfaces. Because the trace metal content in obsidian is source-specific, geochemists can also determine the origin of the obsidian in artifacts. 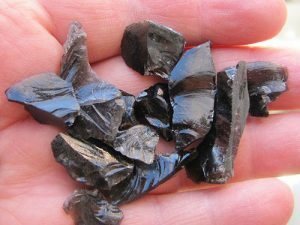 Because these unique chemical “fingerprints” can “source” obsidian, archaeologists are able to reconstruct ancient trade systems. As an example, the obsidian in many Native American artifacts from southern Arizona was found to have originated in lava flows 1,000 miles to the south, in Jalisco, Mexico. The most culturally significant obsidian source in the United States is Yellowstone National Park’s famed Obsidian Cliff, a ridge that formed from a flow of viscous rhyolitic lava about 180,000 years ago. Native Americans first quarried obsidian from this site some 12,000 years ago. This obsidian was widely traded and has been found in cultural sites as distant as Ohio and eastern Canada. Obsidian has served as a gemstone since antiquity, reaching its height of popularity in Victorian-era jewelry, along with such other black gem materials as jet and the tourmaline mineral schorl. Lithophysae—cavities filled with concentric structures of quartz, topaz, and certain feldspar and tourmaline-group minerals—are responsible for the distinctive “blotch” pattern of “snowflake” obsidian. varieties, along with tumbled Apache tears, are set into brooches and pendants. Obsidian is also fashioned into spheres, figurines, and other decorative objects, especially flaked points and knife blades for display. Obsidian gems and rough are often imitated. Most imitations consist of dark glass with obsidianlike coloration and patterns and nearly identical conchoidal-fracture surfaces. 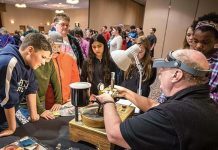 With its rich history and lore, remarkable ability to take an edge, and interesting scientific and gemological aspects, obsidian is quite a “mineral”— even if it doesn’t qualify as one.